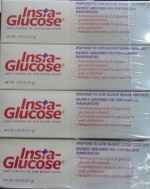 Relieves Hypoglycemia Fast The full 24 gram dose of carbohydrate in Insta-Glucose is twice the strength of other gel products, making it suitable for mild and moderate hypoglycemia (low blood sugar). Absorption starts instantly, bringing relief in just a few minutes. Cherry flavored. When a hypoglycemic reaction occurs, swallow entire contents of tube. Grip tube near the top and remove cap by firmly twisting. Place tip of tube in mouth, squeeze slowly and swallow. If no response in 10 minutes, repeat dosage.